This weekend intensive course will provide education and hands on roasting experience appropriate for any new or novice roaster. The class will develop sensory skills, new techniques for evaluating coffee, learn how to buy and store green coffee, roast profile development, as well as blend development. The weekend intensive class includes snacks, beverages, lunch each day, written resources/documents, 12 pounds of specially curated green coffee for each participant to take home, and an end of class BBQ dinner on Monday evening. Participants will learn about roaster safety and fire protocol. This training satisfies the training and safety onboarding requirements for the Buckman Coffee Factory. Participants will learn the anatomy of the roaster, maintenance, roast curves and how to log roasts manually as well as through software. Participants will explore washed coffee from Central and South America, including how to develop roast profiles best suited to the terroir of the region. Participants will also learn the basics of green coffee buying, including planning, cupping for quality evaluation, and price discovery. Participants will explore African coffees with particular attention paid to high density washed coffee coffee. They will learn how to approach African coffees in profile development. Participants will also learn how to cup with the SCA cupping form and score coffees, including recognizing coffee defects. Participants will explore natural processed coffees with particular attention paid to natural processed coffee. They will learn how to approach natural processed coffees in profile development. Participants will also learn how to cup with the SCA cupping form and score coffees, including recognizing coffee defects. Participants will learn about roasting and blend management for filter and espresso extraction. Participants will learn how to create quality control parameters for customers and leverage this expertise in their business. Emily Smith has a background in green coffee, including quality evaluation and supply planning. She is a licensed Q Grader and has worked managing and processing green coffee for large roasters in the Pacific Northwest. Emily is also an expert sample roaster, having roasted thousands of samples for quality and price discovery evaluation. In addition to roasting for World Cup Coffee, she also serves as a director of the Oregon Coffee Board. The Buckman Coffee Factory is a shared-facility roastery, education hall and event space located along Roasters’ Row at 1105 SE Main Street in Portland, OR. The Factory’s services include rentable coffee roasting equipment and a flexible, light-filled workspace designed specifically for small to medium scale roasters. Our Cupping & Education Room is also available for public and private coffee events -cuppings, social events, meeting space and lectures. The three day roasting intensive at Buckman Coffee is $1350. Registration is strictly capped at 8 participants. Early registration is highly encouraged. Our education classes provide a bridge into the world of coffee roasting, tasting and sensory analysis, and brewing. 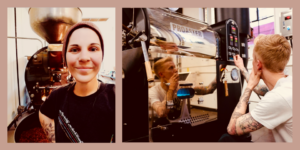 We’ve created a number of thoughtful courses with a range of students in mind: from coffee enthusiasts looking to expand their horizons, to baristas interested in branching into other aspects of the industry, for the aspiring home roasters wanting to test out professional grade equipment, all the way to established coffee professionals looking for continue their education opportunities. Please find descriptions of the classes below. 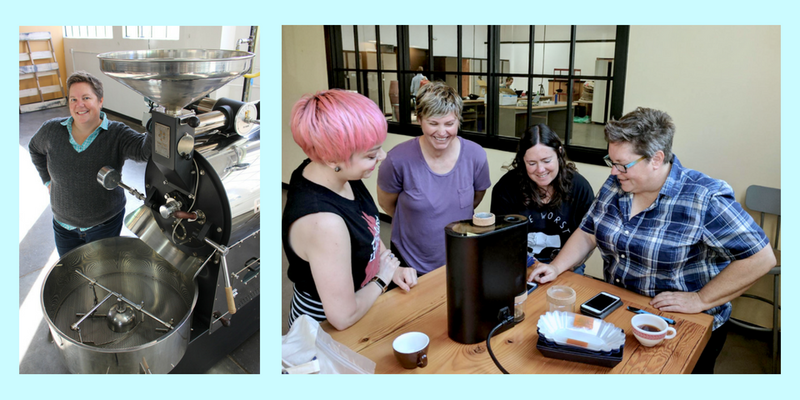 In collaboration with Portland Community College’s Continuing Ed program, The Buckman is offering three, entry-level courses for those who want to take their love for coffee to the next level. Joey Gleason (Co-Owner of the Buckman) and Stephanie Backus (Buckman’s Director of Development) are leading these classes to introduce the general public to the dynamic and intricate world of coffee. REGISTER via PCC’s CONTINUING ED SITE. Have you ever wondered how coffee roasters choose the beans they are offering? You will learn the flavor nuances of coffee grown in different regions of the world while learning the process of cupping coffees (sampling taste and aroma). Sign-up to get the latest on our green coffee offerings, new crop cuppings/tastings and other upcoming coffee events.